Teresa Berganza Interview with Bruce Duffie . . . . .
"Her execution of florid music and ability to color words and phrases make her the ideal Rossini singer." 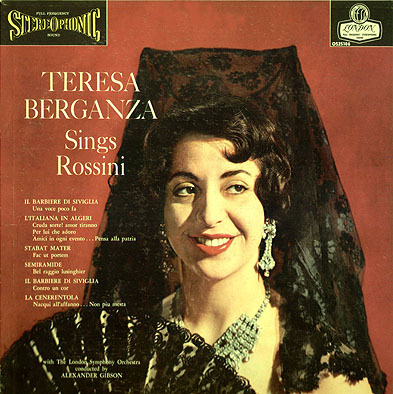 Thus spake Harold Rosenthal in the New Grove Dictionary about mezzo-soprano Teresa Berganza. And she is, indeed, a wonderful artist whose youthful sound, looks and zest for life belie the fact that she recently celebrated her 50th birthday. 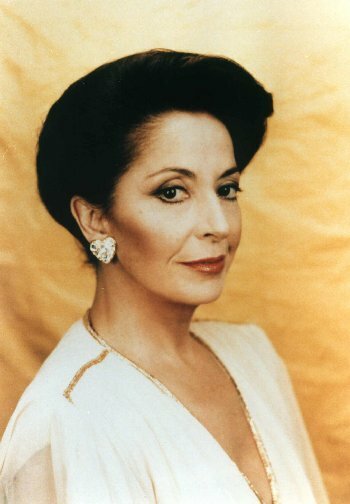 She remarked that many people think she is much older because of the fact that she sang in Cherubini's Medea with Maria Callas. That was in Dallas in 1958, where she also sang Isabella in Rossini's L'Italiana in Algeri. The previous year she made her debut in Aix-en-Provence as Dorabella in Mozart's Così Fan Tutte. That first season, she also sang at La Scala in another Rossini work, Le Comte Ory, and before venturing to the Lone Star State, she appeared in Glyndebourne as Cherubino in Le Nozze di Figaro of Mozart, the role which also introduced her to Chicago in 1962 and the Met in 1967. But it is as Rosina, Cenerentola and Carmen that she is most known these days, having sung these characters all over the world, as well as making fine recordings of them. Last fall , Lyric Opera of Chicago presented the Ponnelle production of Bizet's Carmen, and during that time it was my great pleasure to arrange for a conversation with this famous singer. We met in the charming salon of her hotel and the five of us (myself, my guest, her daughter, my wife and the translator) had tea and talked about not only opera, but many things which affect both the life of an artist and the world in general. Here is much of that wonderful conversation . . . . .
Bruce Duffie: You are a Castilian artist and you've sung, among many others, Carmen and Rosina. What is it about Spanish ladies that attracts composers from all over the world? 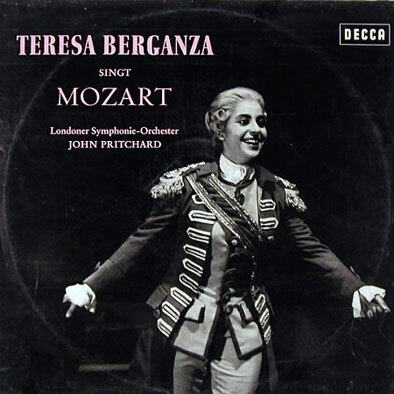 Teresa Berganza: It is not so much the women as it is Spain itself which attracts the composers. BD: Is it special for you to play a Spanish lady whether the composer is Spanish or not? TB: Yes, because I am able to bring to the roles the knowledge and the awareness and personality and understanding of the characters. BD: Have Rossini and Bizet captured the Spanish spirit? TB: I think both Bizet and Rossini have succeeded very well – Bizet particularly because he was captivated by the novel of Mérimée. However, all the composers – including Rossini and Bizet – were able to work through the text which had already grasped what these characters are. BD: The text more than the music? TB: The texts, of course, are not the whole thing, but the texts are very important. It is important when you’re coming to interpret the role. There are no great operas without great texts, so when you come to interpret them, that is when the text comes into play and makes it possible. If it were not for the importance of the texts, the composers would have simply written la-la-la, and the audience would have to guess what was happening! The importance of the text cannot be over-emphasized. Other composers have written about Spain – including Verdi – but for Rossini and Bizet, the texts are very important and they have preserved the form and character which comes across because opera is a form of theater and without a text you don’t have theater, so the words have to work. BD: But Rossini is often accused of using poor texts. Are his really great? TB: We should probably have started this discussion with The Marriage of Figaro of Mozart. It is true that the texts have to be good and some of the texts are less good [the translator used the word “indifferent” with which she agreed], but the texts are never really poor. L'Italiana in Algeri has a good theatrical text, and Cenerentola also. It’s a fairy-tale. TB: We were talking about poor texts and that one is not poor. BD: Being so aware of the texts, do you sing any of your roles in translation, and if so, do you feel translations work in opera? TB: I never sing them in translation. It seems like an absolute betrayal of the composer. BD: Even when the composer wanted to have his texts understood, and often endorsed translations? TB: No one would dream of tampering with or touching up a painting of Goya or El Greco. Therefore the creations of geniuses of music – like Monteverdi, Mozart, Rossini, you can name them all – likewise should be performed as the composer intended and should not be touched. It is not necessary to alter them to communicate to an audience because the composers have already done that. BD: Is there, then, any closer communication when you’re singing Rossini in Italy as opposed to Chicago? BD: Is the audience, in general, more informed than it was 25 years ago? TB: No, I think they are getting worse. BD: Have you a theory about that? TB: Today, there is a tendency to give opera in huge stadiums – 6000 or 7000 people – and this has inspired a new kind of opera-goer: someone who goes to opera merely for spectacle, the way they would go to a circus or a football game, or to a rock concert. Before we started having this mass-appeal, the audiences tended to love the opera – not that they studied it, but there was a love of it. They went often. You don’t learn to love it from one year to the next, but if you continue to go, and if you love it, then your reactions to it will be of a different aesthetic character from those who are just going to for the spectacle. Now, I’m talking primarily about Europe rather than the U.S., where I have much less knowledge of what is happening. But in Europe, I feel the change in the attitude of the audiences toward opera, and the origins of this change lie in the education of children in schools. Classical music is not taught, so children have no access to it. On TV and in the popular media, they are exposed to rock music from their very earliest years, and just watching it you can see that their reaction is different. There is not a reaction of intellect. When you watch a small child of 4 or 5 listening to rock music, they are not just sitting there listening intellectually, they are jiggling and agitating around, which would indicate that there is something strange going on, and it is unfortunate that parents who observe this behavior in their children are not concerned enough to send them off to hear some music of a more serious nature. The lack is in both primary and high school levels. There is a lack in the basis of culture, and we can’t just lay the blame at the schools. It is in the society and the people of the nation. People will take their children to the football game and explain to them what the plays and rules are, or they will explain while they watch it on TV, but they won’t do that for music – not only opera, but for all serious music. This needs to happen when they are young. If you take someone to the opera for the first time when they are 30 or 35, this is perhaps too late to establish the kind of love for opera that would have been possible if they had started as children. BD: Do the parents know enough about music to be able to explain it to the kids? TB: It is late – I cannot change the world. TB: Yes, there is even good rock music, but I make a distinction between rock music and noise. BD: Where do you make that distinction? TB: I am not an expert in rock, but there is rock music which has rhythm, melody and text, and that I would call good rock music. There are other rock performances, however, where the singers do not really sing. They talk and they shout and make noises, and they twist themselves into contortions which produces a kind of hysteria in the audience – especially in young people – and this is a result of this lack of cultural appreciation. The rock concerts would not be so successful if the audiences were more sophisticated. BD: There is no entertainment value at all? TB: There is entertainment value in painting and sculpture. If I were looking at a painting, for instance the Assassination of Maximillion II, there would be things in it which would fascinate me, but it would not amuse me. It would not entertain me. Likewise, when I go to the theater, if I see a comedy of Mozart or Rossini, then I am entertained. But if I go to see a tragedy or drama of any of the great composers, then I am not entertained, but I am absorbed and interested. I can follow it and appreciate it. TB: Naturally. Opera for me is music, and music is food for the soul. When I hear the music, it nourishes and enriches. Life consists of both kinds of experiences. There are moments of tragedy and moments of laughter, and when you go to the theater you can enjoy both kinds of performances because they reflect both kinds of life experiences. BD: Is Carmen at all a nice lady? TB: Yes, she’s a delightful lady – enchanting. The problem with audiences going to see Carmen is that they don’t understand who she is. She has so often been presented as a bad prostitute, and she is not a good or a bad prostitute. She is a gypsy woman. Audiences don’t often understand that. If she were a prostitute, she wouldn’t be working in a cigar factory. She would have accepted Don José and then given him horns [deceived him] with 5 or 6 men at the same time. If she were a prostitute, she would have a rich lover and be covered with jewels. And, if she were a prostitute, she wouldn’t have stood up to José and let him kill her. She would have fled. But she is not that. She is a free spirit, a special woman. . . a liberated woman. BD: Do these kinds of women still exist? TB: Of course. It is important to understand the gypsy people, because they are free people. BD: Does Carmen plan a few steps ahead or does she just let things happen around her? TB: Carmen believes in destiny. She believes in the cards, so as to preparation, she doesn’t believe that it would make any difference. The destiny is there. She has read it in the cards and she goes forward to meet this destiny at the end. This is the story that Mérimée wrote in his nouvelle and this is the story that Halévey and Meilhac wrote in their libretto and what Bizet put into the music. BD: So she goes to meet it rather than fight it? TB: She does not fight. She accepts. BD: Let me ask about the character of Charlotte in Werther. TB: She is exactly the opposite of Carmen. BD: Is it a different woman, or two sides of the same coin? TB: Charlotte is a completely different woman than Carmen. She is a woman who has been raised and trained in a society. She is the victim of the society. She knows that certain things she can do are OK and other things are wrong. She is in love with Werther, but she does not dare to leave her husband. She would not consider leaving her husband. BD: Is she in love with her husband, Albert? TB: She is a victim. Her relationship with Albert is imposed upon her by her family. Her dying mother put it into words on her deathbed, making all the more potent a force to turn her into a victim. To understand Werther, you have to read Goethe. BD: Is Carmen a victim of destiny as Charlotte is a victim of society? TB: Charlotte is the victim. Carmen is not a victim, she is a liberated woman. BD: Because she is a victim, is it right that Charlotte be a mezzo rather than a soprano? TB: Really, the tessitura is that of a soprano. Mezzos sing it, but it really is a soprano role. BD: Why do mezzos sing it? TB: Sopranos are used to singing the heroine, and Charlotte is not the heroine. On the other hand, many sopranos have wanted to sing Carmen and have done so, and probably for the reason that Carmen is clearly the protagonist. Sopranos and tenors have a different mentality. [Laughter] To give you an amusing example, I was singing Carmen recently at Covent Garden, and it was interesting to watch the arrival of the singers. The tenor arrived in a magnificent gray and silver Rolls limo, and I arrived on the Metro. TB: No! They are more normal. BD: Do you like being a mezzo? TB: I believe that mezzos and baritones are the real voices. Of all of the instruments, the one that I love the best is the ‘cello. It is the most touching and most moving. I would not want to be any other voice. BD: No desires to move up to soprano? TB: At the very beginning of my career, I could have gone that way and become a soprano, but there was no attraction for me to sing that repertoire. I wanted to be a mezzo and I’m very happy with it, and would not consider changing now. BD: Why do you feel that so many others try to change to soprano? TB: You will have to ask them that question, and if you find out the answer I would like to know! Perhaps it is the desire to always be the protagonist, the leading lady, and that is the difference in mentality which pushes them in that direction. But I have no desire to change myself, so I really haven’t thought about it too much. TB: She is a girl with both feet on the ground, according to her era. BD: Is she a strong woman? TB: No. Strong enough for an 18 year old girl. It’s interesting that the characters of both Rosina and Carmen are clearly put forth in their opening musical numbers. Rosina’s first number is Una voce poco fa, and she tells you exactly who she is. She sings that she is docile and obedient, but if you touch me on my weak spot then I become a serpent. 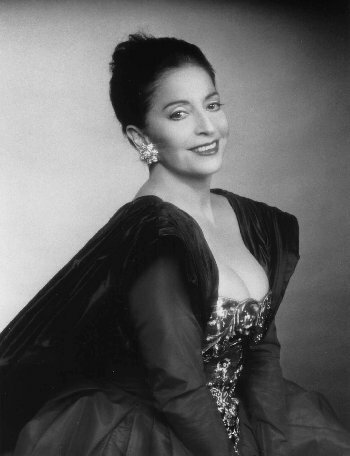 Carmen is asked by the men when she will love them, and she says perhaps tomorrow, perhaps never, but not today. She is very up-front with who she is, what she is. BD: So does Rosina try to become a master of her destiny? TB: You can’t say that she dominates her destiny. She lives as best she can. She is under a great deal of influence and pressure from Dr. Bartolo who controls her. If she is to slip away and give a kiss to Almaviva, she has to steal away to do that. She is not free like Carmen who would just do it. BD: Would Rosina be happier as a Carmen-type character? BD: When you’re on stage, are you portraying a character, or do you become the character? TB: When I’m doing a role – not just when I’m on-stage, but during the preparation, too – I sometimes lose track a little bit of who I am. Whether I am Teresa Berganza or Carmen, I really become the character a great deal. Right now, I feel a little bit like Carmen, but don’t push me too far! I’ve put on my Carmen face. BD: What happens when you do two roles during the same period? TB: I never do two at a time. BD: Earlier in your career, how did you decide which roles you’d sing and which you’d turn down? TB: At the beginning, I was attracted to those which my voice dictated I’d sing. I would only sing roles that I could adapt my voice to, or were adaptable to my voice. But it was the basis of my instrument, my musical background, my musical foundation and my personality that led to the roles that I performed and that eliminated other roles which I put off until later. BD: Did you feel these roles were imposed on you? TB: No, my voice imposed the roles. BD: Are you happy with these characters? TB: I am happy, content with the roles which are now in my repertoire. Whatever I wanted to do, it was my ambition to do it 100%. I was not striving to have a certain number of roles, but the roles that suited me that I did well, that I was able to deliver this 100%. Those are the roles which I wanted to do, that I have done, and I’ve very happy with my career, and have been at all stages of its development. TB: It seems very artificial. BD: Then what is the point of them? TB: I would rather stay at home than sing with a bad conductor, and it’s the same with the recordings. You make them if they are going to be decent, but otherwise avoid them. It is part of a career that you have to do these things, and that doesn’t mean I don’t like them. BD: Is it wrong for the public to be so enamored of discs? TB: The more they love them the better. If they love me as a result of the recordings then I like that. It’s not bad for the public to listen to the records, but it would be if they did that exclusively. They should eventually come and hear the artist in person. Otherwise, you develop a deformation of the ear. I am very proud of the records that I have made. I have participated in sessions where I am sure that there are no engineering tricks being exerted. I have seen many cases of people with very small voices who, by means of engineering and recording, have turned out to have gigantic, dramatic voices. I have seen people who were two tones short of a high note, all of a sudden producing the high note on the record. In those cases, a recording is a kind of fraud, a kind of counterfeit, a kind of deception. I have been very careful with my recordings, and I have been very pleased with them because I have been present while they have been being made and I have listened to the final result to make sure that it is what I wanted to be on the record. BD: When you’re singing a role in the opera house that you’ve recorded, are you competing with that disc? TB: Yes, it is a form of competition. I always want to sing better than I did on the record. I am never satisfied with the records. There is something spontaneous missing always on the records. A microphone in front of me when I am singing doesn’t allow me to be free. BD: Then are broadcasts different from performances when there are no mikes around? TB: They are weird animals and I don’t like them. I like to have them placed where they cannot be seen. There are always many problems. BD: Does the size of the house matter? TB: What is important is not the dimension, but the acoustics. You can sing in a small house with 1300 seats with miserable acoustics, and you can sing in a house with 5000 seats where the acoustics are wonderful. BD: How do you overcome a miserable acoustic? TB: There is no way to overcome a poor acoustical place. You do your best, you struggle with it. When I sing in a house, I have to hear the harmonics of my voice coming back to me. When they don’t come back, the interpretation at that moment is less. TB: I believe that opera has always been an art form for minorities and it will never be an art form for the majority. However, those minorities that enjoy the opera seem to be increasing. BD: How do we get more people to come to the opera? BD: Have you ever had a piece of scenery fall on your head? TB: These kinds of things don’t happen to me because I am light and slender and very active, but there is one funny story that happened at La Scala. In Rossini operas there is always rain, and in Ponnelle productions it is always visible. I was making an entrance doing my recitative, and I ran faster and faster and began to slip on the wet floor. I fell and ended the recitative, but these things don’t usually happen to me. I was amazed that the audience was so involved that when I started to slip, they all gasped, and when they saw that I had not hurt myself, there was relief. But they were with me and hung on every action and movement of the singer during a performance. BD: Is it better for you when the audience is “with” you, and how do you get them to be with you? BD: Has operatic stage direction gone too far? BD: Is that good for opera? BD: From your point of view, are the musical standards higher today than they were 25 years ago? TB: I think that the kind of performances that are being offered to audiences nowadays is worse than it used to be. I had an extraordinary stroke of luck that my career happened at the time that it did. I began my career on the stage working with great conductors like Abbado and Giulini and Solti, and great stage-directors like Ponnelle and Zeffirelli. This was a period when all the singers worked to create the very best possible performance of that music and the greatest possible theatrical portrayal of the characters, and this was arrived at because the rehearsal periods were a lot longer than they are now. In the old days there used to be 25 days worth of rehearsals before the show took place, and during that time we worked very hard. There were 4 or 5 rehearsals with orchestra plus a pre-dress rehearsal and a dress rehearsal. So, with that kind of preparation, the performances came off in a way that is probably no longer possible. Now, in the places where I go, the rehearsals are a week or 10 days before the show opens, and there are many singers who don’t even like to give that much! They’d like to come a couple of days before the show, sing their performance, pick up their check and go on to the next city where they do the same thing again. Since this is becoming more and more wide-spread as a practice, I believe that the performances being given nowadays are not of a quality that they used to be. BD: Is this because there is too much opera going on? TB: Art has become more commercial, and artists don’t escape this. In the old days, not everybody had a car; now everybody has one. Even before I started, say 40 or 50 years ago, singers could really only sing 4 or 5 times a month because everything was slower-paced in life. In order to get to the next theater, there would be a long journey. Now, with the Concorde, one can sing in London one day and New York the next. BD: Are you, then, not optimistic about the future of opera? TB: I am always optimistic. BD: I assume you enjoy singing? TB: Very much. It’s my life – well, half of my life. Actually, I lead a double life, and at this point they are equally important to me. I love to sing and I love to perform and that’s very important to me, but I am equally intent about my private and personal life, my husband, my children, my home. At the time when I don’t perform any more, I will relinquish that part, but at the moment they are both very necessary and I derive equal satisfaction from each half of this double life. BD: Is it harder for a woman to be a great artist than a man? TB: Naturally, the woman’s relationship in the family is different. She has to carry the child for 9 months but a tenor can engender the child after a hard day’s work. And she can’t just forget about the children and go to work; she is responsible for them. She has to care for them and keep them in mind in a way that is different. The whole hormonal system is different in a woman and can change after the birth of a child. Physiologically, a woman is much more complicated. BD: Are any of your characters mothers? TB: I have enough of that in my private life; I don’t have to sing it onstage. BD: I just wondered if being a mother onstage was easier after being one in real life. BD: How do you like to have your name pronounced? TB: Tehr-rais-ah Behr-gahn-tha. I love the name pronounced the way it should be pronounced. It is a very Castilian name; it occurs in Don Quixote. It was the name of the dog. My husband is very free of all the complexes; he frequently introduces himself as "Mr. Berganza." This is my second marriage – the first was to a pianist, and a marriage between two artists is very difficult. It was Carmen that liberated me from being the slave of the pianist. BD: Do you ever feel you are a slave to your voice? TB: Yes. A slave with pleasure, but very, very much enslaved. I think I speak for those in my profession at large. We all know people who go to bed at night and feel that tomorrow will take care of itself, but a singer goes to bed and has to worry what’s going to happen the next day, and worry what happened today. Did I talk too much? Is there a hormonal disorder that can throw off my voice? Did I eat the wrong things that could possibly affect the way I will sound tomorrow? Even an emotional thing can do it – did I get very angry or hurt or very tired? All of these things can affect the way I will sound the next day. So, a person who has a voice is very much enslaved by it and also, to a very great extent, worried by it, wondering whether it will be there when I want it. I know I might be suffering from a reputation of an artist who cancels a great deal, and I would like to clarify that. I will never permit myself to sing under bad conditions when my voice is not ready to sing. I have been made a part of a trio and I’m proud of the company – the conductor Carlos Kleiber, and the pianist Arturo Benedetti Michelangeli. We all cancel when we feel we are not ready to give our best, 100%. I don’t really cancel very often, but when I do, that is why. I must always have respect for myself and for my public who is coming not to hear what is left of me, but to hear Teresa Berganza. It is my life. BD: Will you be back in Chicago? TB: Nothing has been arranged yet, but one critic was very complimentary about my Carmen, and he hoped that I would return, so maybe the critic was right. This conversation was held in Chicago on December 1, 1984. She spoke in Spanish and the translation was provided by Alfred Glasser, Director of Education at Lyric Opera of Chicago. Portions of this conversation were broadcast (along with recordings) on WNIB in 1995, 1997 and 2000. The transcription was made in 1985 and published in The Opera Journal in September of that year. This re-edited version was posted on this website in the summer of 2008.